Zen Studios is known for games that are addicting to play, impossible to put down, and available on a variety of platforms. 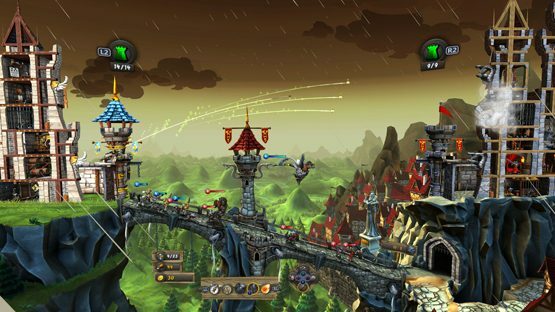 CastleStorm originally released on PS3 and Vita (along with PC, mobile, Wii U, and Xbox 360) four years ago, a cross between a sort of tower defense, real time strategy game and Angry Birds. A year later, the Definitive Edition released, packaging in the DLC and bringing CastleStorm to PS4 and Xbox One. Of course, Zen Studios wasn’t content. In 2016 CastleStorm VR was released for Oculus, and 2017 now brings it to PlayStation VR. Just about the only thing left to do is sear the game directly onto your mind, or force your neighbors to play a live version of it in your neighborhood. If, despite it’s numerous releases since 2013, you aren’t yet acquainted to the game, let’s jump into what CastleStorm is. Simple enough for mobile, yet engaging enough to keep people playing on console, CastleStorm is a 2.5D tower defense strategy game. You’ll be deploying a variety of troops, to battle across a side-scrolling battlefield while shooting a variety of projectiles from your castle walls at the enemy. There are also a couple of heroes you can get direct control over, but it will take away your ability to fire the ballista at the same time. Win by capturing the enemy flag or destroying their castle. Every mission ends up fun and varied, with a host of new abilities, troops, and projectiles opening up as you move forward in the game. 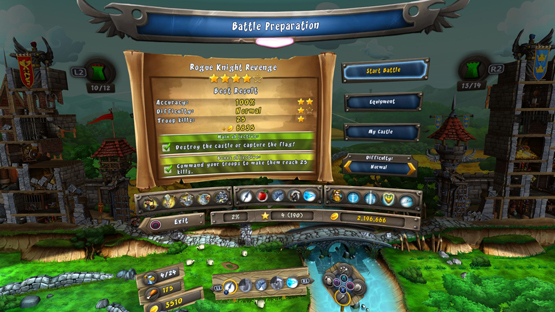 Some missions limit what you can do, like disabling the ballista, forcing you to find alternate strategies to win the level. Using gold earned during the missions, you can upgrade the various tools, like making your projectiles stronger or increasing the health and power of certain troops. CastleStorm does a great job allowing you to play how you want to, expanding your arsenal based on your play style, but also providing occasional limitations and challenges to guide you to potentially using lesser utilized abilities. It’s a great balance that games too often don’t get right, but as is the case with most every addicting Zen Studios game, CastleStorm never gets dull. What adds to making CastleStorm feel like your own game is the ability to build custom castles. These castles bring in that Angry Birds aspect as you target the walls of your opponents’ castles while trying to protect your own. The castles are more than just visual. The rooms you place in your castle determine certain abilities, upgrades, and troops that you can use. If that room gets destroyed, whatever bonus it was providing to your side is lost. Trying to pack your castle full of bonuses makes those rooms easier to destroy, but shoring up your defenses leaves less space for rooms in your castle build, so you’ll have to play with what works. Knowing that it’s a side-scrolling game that can be played on a mobile device, I’m sure you’re wondering how or why CastleStorm needs a virtual reality release. It’s not exactly the type of game to cry out for VR, though I often find these types of applications to provide the best innovation for the platform, pushing it more towards the unexpected and allowing developers to think outside the box of typical first-person VR games. CastleStorm VR does two amazing things with virtual reality that I hope other developers look at as they create their own VR experiences. When the game started, I found myself in a medieval theater, wooden seats all around me, presumably my helmet and sword on one side, a drink and bucket of popcorn sitting on the other. Craning my neck, I could see the king and princess a few rows behind me watching the “movie,” which is actually the game. The main menu and all of the game’s cinematics (which are actually quite entertaining and keep pace with the game’s progression) are presented here in this theater, and I thought that the entire game would be here. Was this an easy way for remasters and re-releases to reach virtual reality? That worry was quickly vanquished as the first mission started. I was looking down at that side-scrolling world like it was a little miniature in front of me. VR incredibly made CastleStorm feel like I was playing with toys. This wasn’t a game on a screen anymore. Virtual reality does just what its name says and makes the virtual feel like reality. You can lean in to the battlefield and look around from side to side. VR doesn’t add any kind of fundamental functionality to the game, but it adds a depth and character that isn’t there in the flat screen version of the game. 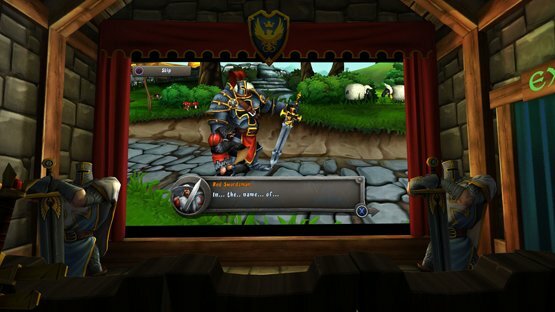 CastleStorm VR has a theater room for the game’s cutscenes. CastleStorm VR is not a necessary VR release, but it is a fun one, showing the possibilities for traditionally non-VR titles on the platform. Head tracking works well, and playing the game feels like you are playing with a physical medieval play set. If you’ve played CastleStorm before, it may not be worth picking up again. At the end of the day, this is the same game that’s been coming out in various forms for the last four years, but I’ve had the most fun playing it in virtual reality. With CastleStorm constantly updating and making better versions of itself, I’m just waiting for Zen Studios to announce a sentient CastleStorm’s campaign run in 2020. CastleStorm VR review code provided by developer. Reviewed on standard PS4. For more information on scoring read our Review Policy.